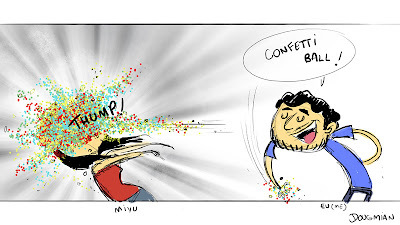 Here in Brazil, when somebody wants to be recognize about what he/she has done or wants some attention for it, we like to say that person wants "Confetti". You know, that act of throwing confetti to make the occasion more special that it is. This idea appeared when I was talking to my friend Miyu because I was convincing her that her opinion it's important. So, I think I should throw a ball of confetti to make her understand it!